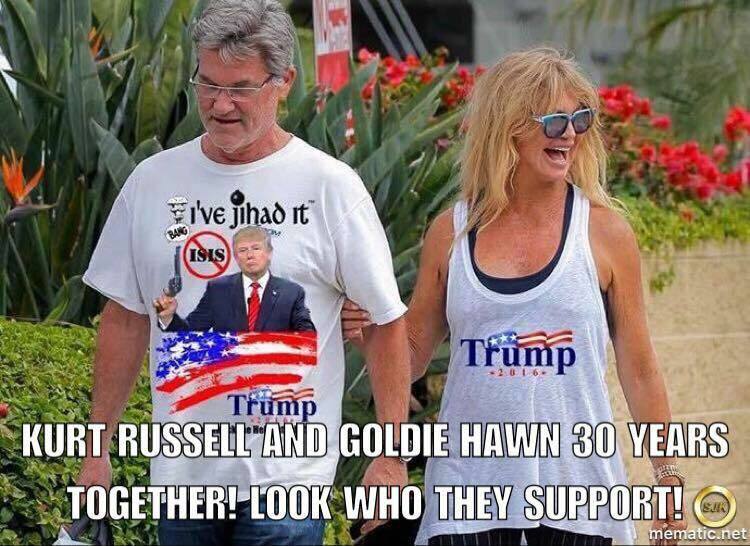 You know Democrats are in trouble when members of “Hollywood Royalty” openly support the Republican candidate. What could be wrong with Hillary Clinton? After all, she has female anatomy, which is an ace in the hole for the next Democrat president to be criticism proof. The first black Moslem president has been able to trample the Constitution under his banana republic boots, so the first female should be able to continue his legacy of tearing down America and rebuilding it in their leftwing socialist image. Hillary has been able to claim she doesn’t know what classified material is after twenty years in the top of government, but her zombies believe she has the utmost respect for national security and the law. Which is worse; that Hillary is the most corrupt person ever to run for president who has built vast wealth by selling government access to foreign powers, or that she claims to be completely incompetent and senile in handling classified state department materials? It’s not enough that the Clinton Foundation has raked in a hundred millions dollars from foreign governments including those hostile to America, and that money is being laundered as campaign cash for the Clinton political machine under the guise of being a charity with multiple tax benefits. It’s not enough that the Clintons are paid tens of millions of dollars by Democrat donors as “fees for speeches,” as if anyone else in the country can make six figures giving twenty minute speeches. It’s not enough that she installed an illegal server in her basement by which she communicated with foreign powers and domestic donors, and that she destroyed the evidence when subpoenaed by the FBI and claims innocence. It’s not enough that the emails she sent were discovered to have been classified and she, after twenty years in Washington, claims that she couldn’t recognize classified markings. Her lemming zombies will never turn on her and will always fall at her feet and believe what she says regardless of what she does just as they have for Obama. Betraying the nation means nothing to Democrats who hate America and believe it has never been great, but would be great if brought down to their level. Democrats are all in on giving control of America to foreigners and transforming her into a banana republic.